Mike Anderson's Ancient History Blog: Greek Feudalism Links to Europe 500-1500 A.D. I continue to be fascinated by the similarity between the Greek Dark Ages and the more recent European Dark Ages to the point of thinking and writing more about them. I want to test the hypothesis that both periods featured similar human behavior. How this for an idea? What If the human experience during the Greek Dark Ages shows us the model of evolving human behavior in societies – a model that is repeated under similar circumstances? Then the Europeans, with knowledge of the Greek experience, would have known what lay ahead of them. They could have, in fact, predicted their future. Of course, they never had a chance to acquire that knowledge because access to it was cut off by the suppression of pagan thought and culture that came with the early Catholic Church’s efforts to establish dogma. The Europeans were left in the dark regarding Greek history (no pun intended). But let’s not get ahead of ourselves, because we have to create a context for our comparison by more thoroughly reviewing the Greek experience. Take a look at the following diagram, which shows the Dark Ages and the Archaic Period with key dates in the latter identified. 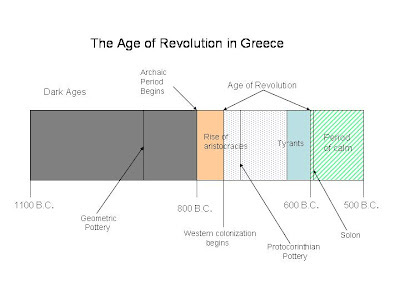 The Archaic Period was dominated by the Age of Revolution which included the most significant changes in Greek culture and world view in its history. We can see how Protocorinthian pottery sits at the beginning of the Revolutionary Period as its documenter. There was plenty going on – colonization, development of the Polis, and changes in Greek religious philosophy. As far as religion goes, it was a period where power of the human mind replaced fear of the gods (think enlightenment). One can imagine the timid man struggling to trade in the animal barbarian view for brain dominance – the winning out of the intellect. The Greeks evolved their religion in response to the upheaval of the Revolutionary Age in three fundamental ways: continuous expression of fear, reinvention of the personalities of their gods, and the creation of cults. Continuous expression refers to the use of monsters in art. By displaying objects of fear, over time they became less fearsome. Early pottery featured lions fighting, while later images make the animals look tame enough to be stuffed. They had become abstract images. The gods were re-invented to show their human side (e.g. Heracles) which included their being re-casted as seekers of justice. This validated the sense of justice and morality emerging in the new Greek society, and made the gods the standard for right and wrong. Lastly, cults appeared as an emotional safety valve. Orphism, mystics, seers, and mysteries helped to put the unknown answers to life in a box. Three major cults emerged – those of Dionysus, Apollo, and Heracles, with the former dominant. Cult worship evolved as a way to purge away fears and reassure the individual he could survive. We see these significant adaptations in Greek religion and wonder about them. Surely religion was serving as a emotional guide, allowing man to think in new ways. But man has always adapted his religion to his situation. Just look at the MTV churches we have today. We also see similarities between Greece and the European Middle Ages. In Europe, it took the reawakening of man’s spirit and confidence in himself to overcome a corrupted fear-based dogma which suppressed his desire to learn. The Europeans only had to rediscover their humanness. The Greeks had it tougher, because there was no past to use as a guide.